Not sure what took so damn long for this to hit Blu-ray in the U.S. but here it is, finally. While I wasn't a skater as a kid I had a few skater friends in my periphery and hung around quite a few, I would read their Thrasher magazines and listen in in their hero worship of the Bones Brigade and skaters like Tony Hawk, Stacy Peralta and Tony Alva, so I had an appreciation for it, but I couldn't skate to save my life, but I also enjoyed the aesthetic fo the sport, and the music, 80's skate-punk music like the Descendents and JFA was awesome. Lords of Dogtown came out in the wake of Stacy Peralta's phenomenal documentary Dogtown and Z-Boys, and the screenplay was co-written by him so you know it has some authenticity to it, along with some polishes by writer/director Catherine Hardwicke (Thirteen) who added more depth and female characters to it based on her own research into the story. For those who don't know the movie is a biographical look into the early 1970s lives of the Venice Beach teen-surfers Tony Alva (Victor Rasuk, Godzilla) Stacy Peralta (John Robinson, Transformers) and Jay Adams (Emile Hirsch, The Dangerous Lives of Altar Boys) who along with surfboard designer Skip Engblom (Heath Ledger, The Dark Knight) transformed the local surf-scene into a burgeoning skate scene after the advent of urethane wheels which made it possible for the teen surfers to rode the concrete waves of the streets like never before, eventually popularizing the sport into the juggernaut that it became. Along the way there's women, personal differences, jealousies and betrayals all in the name of bloated fame and fortune, the success going to their heads causing divisions with various team members abandoning Zephyr for more lucrative contracts with competitors who were throwing money at them. The movie is shot pretty slickly but has a nice grainy sheen about, a lot of the shots feel like documentary footage, referencing the Dogtown and Z-Boys doc, but also giving some great POV action shots of shooting the pool and tearing up the streets, it gives the movie a great visual style, and the soundtrack in bonkers good, a cavalcade of 70's hard-rockers like Deep Purple, Black Sabbath, T.Rex, Jimi Hendrix, Ted Nugent and Iggy and the Stooges, some of which gave the surround sounds a nice deep workout. The cast is uniformly good, the main cast of teens have great chemistry and pull off the skating wonderfully, and Heath Ledger as the often drunk Zephyr founder Skip often steals the show. Also be on the lookout for appearances from Rebecca De Mornay (Mother's Day) as Jay's weathered, surf-hot mom and the late Mitch Hedberg in a small but pivotal role, and as with a lot of the late heath Ledger's performances, this one gets better with age, he's was gone far too soon, such a talent. Audio/Video: The unrated extended cut of Lords of Dogtown arrives on Blu-ray from Mill Creek Entertainment in 1080p HD widescreen, framed in 1.85:1 widescreen. The image is nicely saturated with deep color, alternating between some 70's sun-drenched California visuals and nicely lit night scenes, it has a nice 70s vibe about it. The audio comes by way of an English DTS-HD MA 5.1 track that nicely exports the the Mark Mothersbaugh, Devo) score to the surrounds for a nice full sound, the 70's soundtrack featuring Cream, Budgie, Blue Oyster Cult and loads more is superb and sounds fantastic, optional English subtitles are provided. Extras ported over from the previous special edition DVD include the two audio commentaries, making of featurette, a gag reel, and a theatrical trailer. Notably they d0 not carry over six of the featuerrtes adding up to about fifteen minutes of content from the DVD, these include a fun half-hour cameo guide and alternate dialogue shots submitted to the ratings board during the classification process. Also gone are about 20 minutes of deleted and extended scenes, a music video of Rise Against covering Black Flag's "Nervous Breakdown", and a storyboard comparison, so you might want to hang onto that DVD for the extras. The single-disc Blu-ray comes housed in a standard Blu-ray keepcase (not an eco-case) with a one-sided sleeve of artwork and a slipcover (o-card), glad to see them continuing this trend of o-cards following the MC releases of Yor and Shakes the Clown - keep it up! The disc features the same key art. 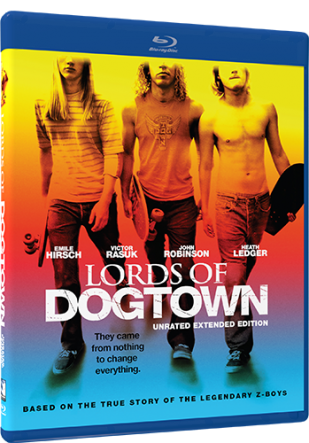 Lords of Dogtown looks great on Blu-ray from Mill Creek, I wish they would have ported over all the extras from the special edition DVD but this is a deal for money. A fun coming of age film with appeal that breaches that of just skate enthusiasts, thoroughly enhanced by a great cast and awesome 70's music.